Will BCN, PSA and VLC all move to LHR T3? Anyone know? Yes, BCN already has some flights out of T3 but will they all move their? Found out on one of the other threads that EZY is ditching LGW-ABZ in Feb. As I having a booking that seems to be affected I have be searching the web for confirmation. Nothing from EZY direct but local ABZ press are reporting it. While I admit that my 10 return flights a year doesn't justify a 12 flights a week, I'm Very surprised as every time I've been on that route is always full. Also found a statement form ABZ saying they are looking for another airline to fill this route. Could this be BA? Maybe with some sort of discount / support from the airport, not wanting to loose more ground to INV. Is it a protected route / LGW slot? I wonder if this is the first sign of no APD INV against APD ABZ distorting the market. Does anyone know if the previously announced south terminal improvements for 2019 allowing domestic / channel islands flight connections have been given the go-ahead? Is there as start/completion date for the works? It seems that Flybe have sold their remaining LGW slots to Vueling (reported at the end of this article). Does this imply that previously bought slots will be used by BA once spare aircraft are found? It's all in the most recent master plan and public knowledge. Yes I believe the move is inline with dual leveling Pier 1 to improve domestic flights and cut down on remote stands / bus gates and most importantly to keep @uncleT happier lol. I remember well those stairs down to Domestics. The planning document for the new pier 1 does show a anti-clockwise route for domestic arrivals as opposed to the clockwise route for internationals. Presumably it's just a case of works in the main building (At old check in b) inc. new domestic baggage reclaim area. Well the reclaim will be 'sort of' new. They're either building a new wall or knocking one down I can't remember off the top of my head but it's the opposite to how it is currently. Although I never fly domestics from/ into LGW so have no personal experience of it many have been frustrated with the setup for a while now & I think it's a good move on behalf of GAL to improve things for those pax. Cutting down on bus gates anywhere for any reason is, imo, never a bad thing. The only advantage they hold is to give us aviation geeks a bit of extra spotting but i'd rather walk across an air bridge everytime. The design & access statement indicates that the domestic arrivals route would be through the pair of double doors to the left. Which would make sense, as two sets of double doors into a corridor that currently seems "unused" would seem excessive. So would this allow Domestic to International connections without having to go out to landside and then back through main security? ie have a proper flight connection area? One lives in hope! The current arrangement [disregarding the bussing aspect] is a time-wasting PITA! I believe that is the idea. The drawings in the design statement seem to deposit people arriving on a domestic into the corridor that you currently use to walk to the gates. 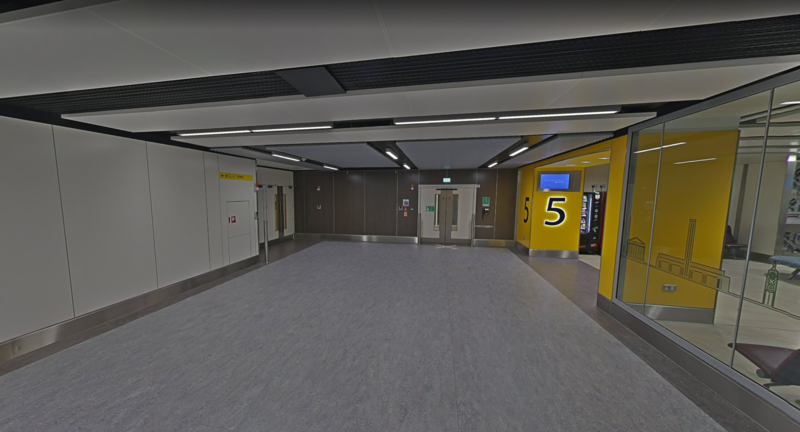 (If you know the new peir 1, you may have seen that each gate has doors from the individual gate airbridge/stair cores back into this corridor) So arrival would be akin to arriving in say edi. Can't be used yet as there is no domestic exit route yet and that is just a case of reorganizing the main building where it meets the new pier 1 in roughly the old check in B area. International arrivals to these gates are sent down the gate stair core on another route on the lower level. Just to add my own bit here, not that I've seen the plans, but I have seen the building work. At the moment there is big work area blocked off in check-in B area against the wall at the end of the check-in hall. BA is next door in A, so this is at the far end from the BA First area, away from the taxi drop-off/ parking/Hilton side. So my guess is that arriving domestic passengers who want to go landside would end up very close indeed to the BA check-in area (at the moment they end up at the other side of the building past M&S and the rail station). Connecting domestic passengers would go through a short passageway to the onwards flight. If so, sooner the better, other than the fact that it may be a slightly congested walk to the station. There again the current exit is fairly congested too. 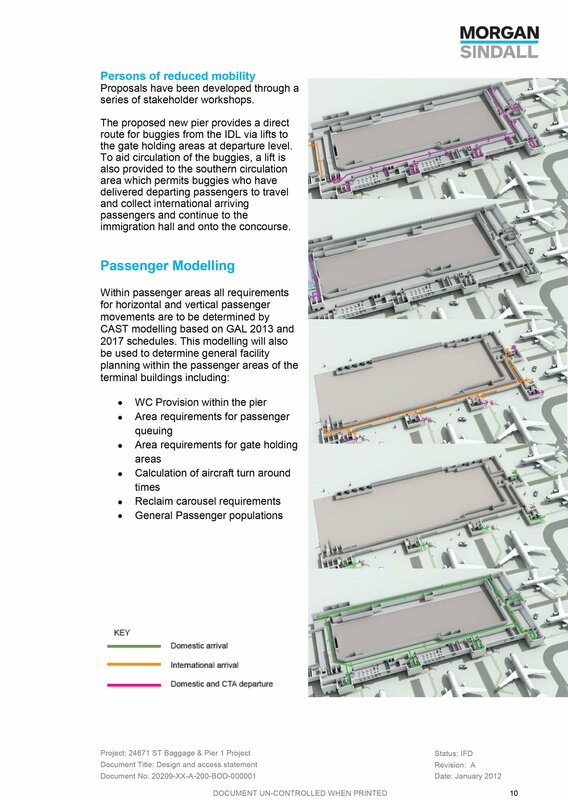 For interest - Passenger modeling and flow route for the new pier 1, taken from the planning design statement.